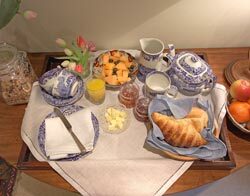 Self-contained central Edinburgh bed and breakfast accommodation for 2. Free broadband internet access. Keys to private gardens. The Guest Room has its own separate entrance and is as secluded a bed and breakfast as you'd like it to be. Comfortable, self-contained, and private with its own shower-room en suite, it is part of Katrina and Fergus Macpherson's home. In the mornings they will knock on your door with your freshly prepared breakfast on a tray. The Macphersons are very accessible and friendly, and always ready to give advice about eating out or what to do and see both in Edinburgh and in the Highlands and Islands. Their home is on the corner (above right) and the entrance of The Guest Room is from the courtyard area at the basement level of the building. 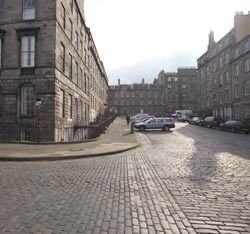 There is splendid residential Georgian architecture all around (Nelson Street was built in 1812), and The Guest Room is less than ten minutes walk from Princes Street, and within easy walking distance of cafés, restaurants, art galleries and pubs. Or, if you would like a stroll in the private gardens of Drummond Place just opposite, Katrina can lend you the keys. 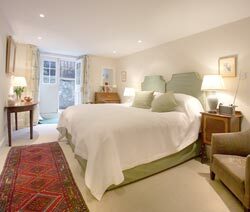 If you are looking for a honeymoon hideaway or romantic break in central Edinburgh The Guest Room could hardly be a more perfect choice. free broadband internet access for your laptop. 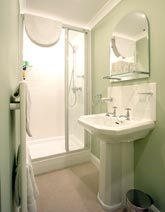 The shower room en suite (through the door straight ahead in the photo above). In the morning Katrina or Fergus will knock on your door with your breakfast tray. Freshly squeezed orange juice, fruit, soda bread, pain au chocolat, croissants, porridge, cereals, fresh coffee or tea. 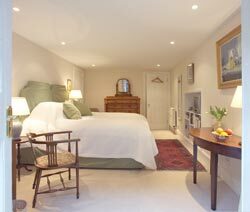 Low season (Oct-April: £75 per night for the room. 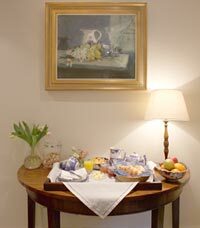 High season (May-September): £85 per night for the room. Festival: £100 per night for the room. Please tell Katrina and Fergus you found their Guest Room through About Scotland!